Left to right: Gaudiose Mujawamariya (AfricaRice), Kalimuthu Senthilkumar (AfricaRice), Elisha Mkandya (ILONGA Agricultural Research Institute) and Silvanus Mruma (NAFAKA) discuss the proposed work plan for the rice team year two activities (photo credit: IITA/Gloriana Ndibalema). 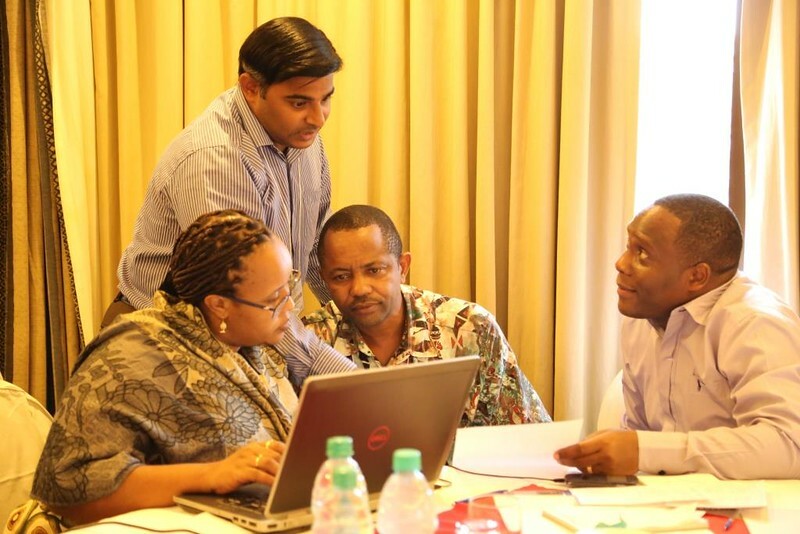 Partners implementing activities under the Africa RISING – NAFAKA scaling project held their first annual review and planning meeting recently (8-10 July 2015) in Dar es Salaam, Tanzania where they discussed effective ways to scaling up improved crop varieties to Tanzania’s smallholder farmers. The meeting was attended by over 30 participants including representatives from CGIAR Centres and research and development sector organizations overseeing scaling activities in the project. 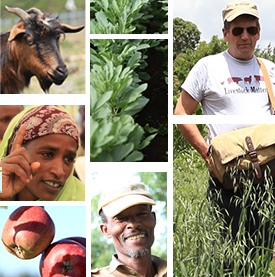 Launched in October 2014 through funding by the United States Agency for International Development (USAID) mission in Tanzania, the project is working to support ongoing Africa RISING research which is disseminating best-practice technologies on vegetable, maize and rice production and better post-harvest practices that sustainably increase whole-farm productivity. ‘This meeting helps us to jointly discuss implementation and planning of our activities as we focus on reaching 47,000 households involved in maize and rice farming in the country,’ said Haroon Sseguya, the Africa RISING technology scaling specialist at the start of the three-day meeting. ‘A key goal for this project involves expanding the cultivation of improved rice production technologies to 116,000 hectares and to increase both maize and rice yields by 50%,’ he explained further. Participants discussed at length the experiences from the first year of implementing Africa RISING in Tanzania and used lessons from the review to plan for the second year of the project. Some of the emerging issues from review of first year activities included challenges in building and maintaining partnerships, challenges arising from poor seed distribution networks in the country and how to overcome them; project reporting on USAID/Feed the Future indicators and identifying the best approaches for scaling up technologies. 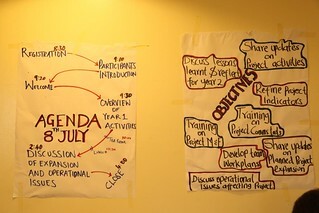 Meeting agenda and objectives (photo credit: IITA/Gloriana Ndibalema). A significant output from the meeting was the development of work plans for the second year of the project by all partners. To address the need for a clear scaling approach, partners agreed to continue visits to ‘mother’ farmers in the initial project intervention sites even after establishing new ‘baby’ sites. Training sessions on project communication tools and monitoring and evaluation were also conducted in order to improve project reporting and documentation. “We came up with work plans that will be jointly implemented by all partners in project sites,’ said Kalimuthu Senthilkumar, a systems agronomist at AfricaRice Center. Veronica Uzokwe, an agronomist and the SARD-SC Tanzania country coordinator, said the meeting helped partners to achieve, within a short time, what they could not have completed working from different locations. ‘We managed to brainstorm and came up with ideas to fast track the process of meeting project objectives as a team and not as independent institutes. The fact that we had representatives from AVRDC, AfricaRice, International Institute of Tropical Agriculture (IITA), NAFAKA, World Agroforestry Institute (ICRAF), International Maize and Wheat Improvement Center (CIMMYT), KATRIN, TAMASA, ARI-ILONGA, ARI-HOMBOLO and others round the table enriched our discussions and enabled quick and informed decision-making about next year’s activities,’ she said. The project management team (PMT), which is responsible for providing oversight on project activities also held its inaugural meeting which was chaired by Irmgard Hoeschle-Zeledon, the Africa RISING coordinator for West Africa and East/Southern Africa, Key decisions taken by the PMT included the need to involve local government authorities in project activities and agreement on way forward with regards to reporting on Feed the Future indicators as well as documentation of success stories. Tags: review meeting, Scaling, USAID. Bookmark the permalink.